Ever since I have realized that it is easy to tame yeast with some tricks, bread baking has become a pleasurable trip for me so far. I have stopped meandering around the corner bread shop. I am glad that the bread basket is always filled with homemade‘s and my little one has got a hang of it. 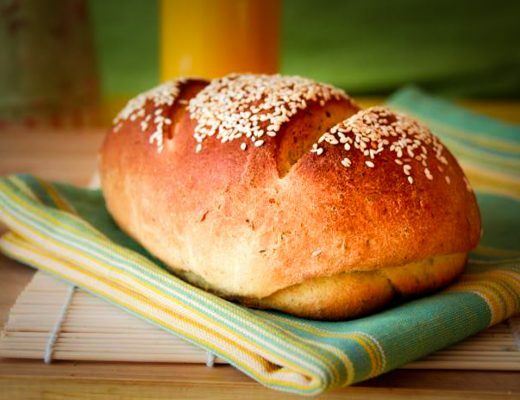 Here is an easy recipe with a slight twist made to a regular bread. Mix all the ingredients in a bowl and knead into soft dough. Grease a loaf tin and pour the dough in it. Cling wrap and set aside till it has doubled in size. Preheat the oven at 200’C and bake for 10 minutes. Reduce the temperature to 180’C and bake for further 20 minutes. Remove and let it cool down. Slice and serve. – The temperature of the water should be 110’F warm. – Knead the dough for at least 10 to 12 minutes. when i read the name “rich fruit loaf” in my blogroll, I was so impatient to come and see it..looks so beautiful..i will try it sometime..
Btw I made your chocolate cake sometime back..it was perfect..
What a gorgeous loaf ! It looks lovelier than store bought ones! No wonder u’re little one is hooked to it! I So very agree on homemade bread being the best..
S- You have a way with presenting your food..Just gorgeous!!! 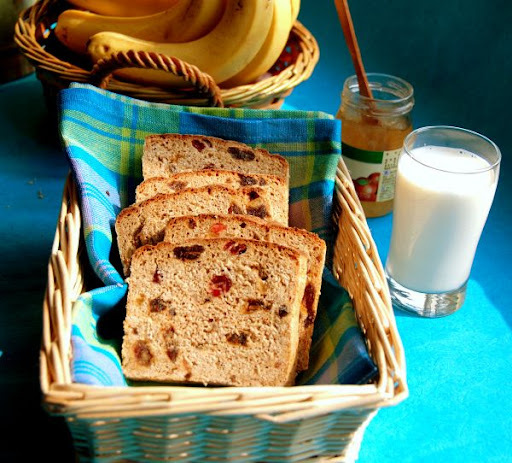 Love this fruit loaf, very nice recipe. Thanxx for sharing!!! so beautiful. perfect for a picnic. Hi, Your fruit bread looks great.Makes me want to try it out. Wow..Perfect Loaf..Thank u for sharing the TRICK part!! 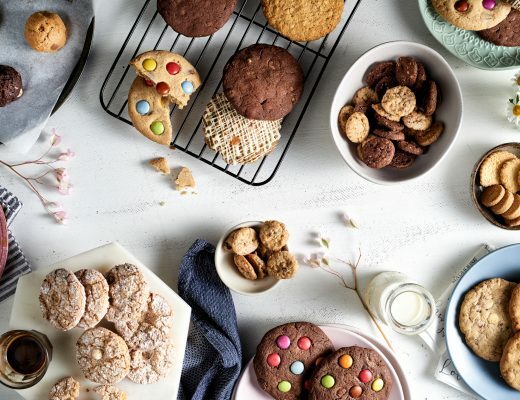 omg,..i am droolin,..nice pics too,..hppy bloggin nd weekend,..hppy janmasthmi too,..:-)..ceeya soon,..
That looks really divine and any-day better than store-bought. I am goin to try this soon..
thats beautiful loaf of bread….once you get the hang of working with yeast, baking becomes a delight. loved your sticky date cake too. yummy fruit loaf! Looks so beautiful. How delightful it must be to always have freshly made bread at home..your lil one is already a conossieur. What a lovely-looking loaf. Absolutely delicious. That bread looks great with all of the dried fruits in it. 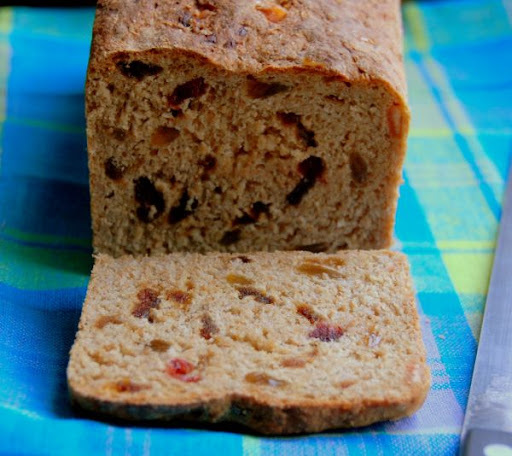 The texture of your fruit loaf looks very good. Nothing beats home made food, every single time. 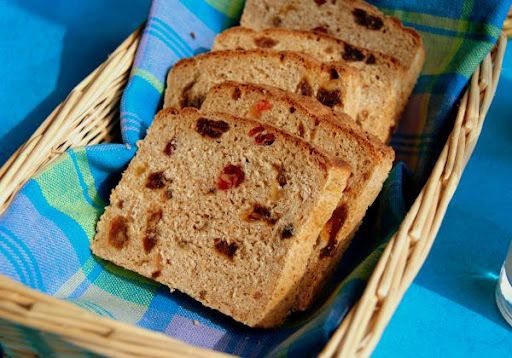 Rich fruit loaf looks so yummy!